Classic fried rice, except made even better with hot dogs and then wrapped in an egg omelette to make a fun, interesting presentation!!!! 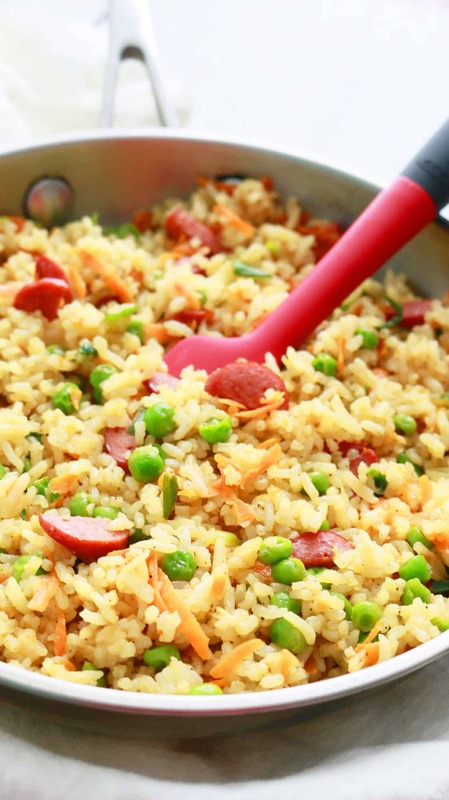 This hot dog fried rice is great for an easy dinner or school lunch box. I’ve always adored the idea of Thai street vendors wrapping cooked rice noodles in an omelette to serve their customers or Japanese mothers serving ketchup fried rice wrapped in an omelette for their little ones. Recently, we enjoyed spam fried rice served in an omelette at a Korean restaurant and my kids thought that was the best thing ever. Clearly, this idea has been around a long time. 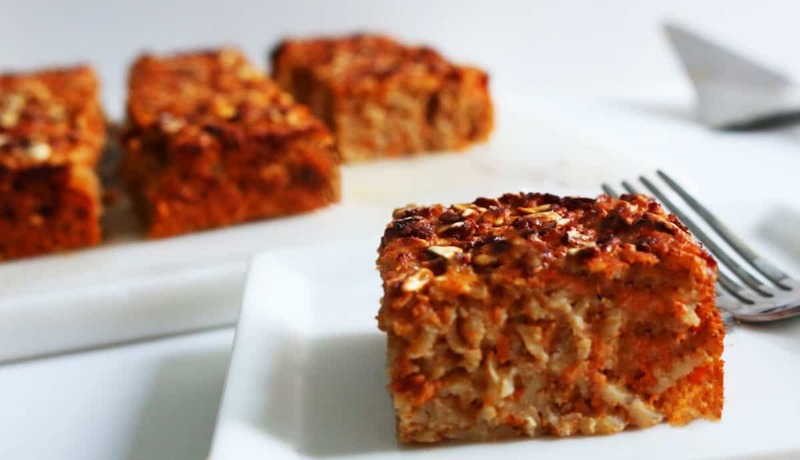 It takes a boring fried rice look more interesting. Ain’t fun?? This is my new kinda comfort food. 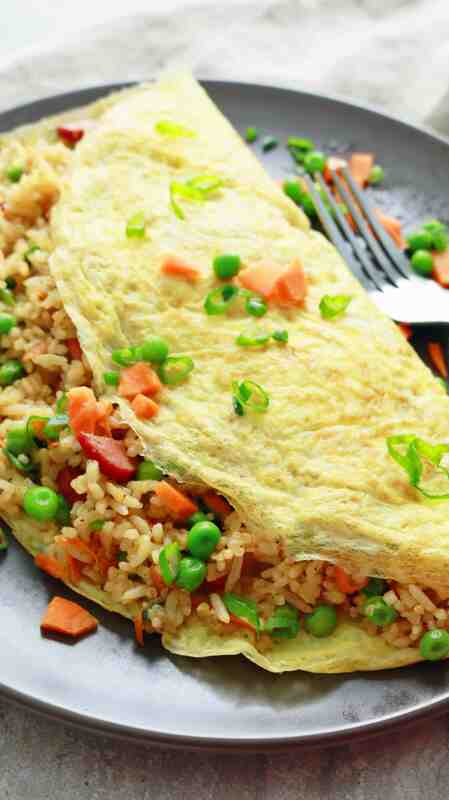 When you think of it, instead of scrambling eggs into the fried rice, its made into a omelette and served on the outside. Brilliant!!!! This fried rice can be made with chicken or shrimp (instead of hot dogs) and any veggies that you have on hand. Refer notes for instructions. 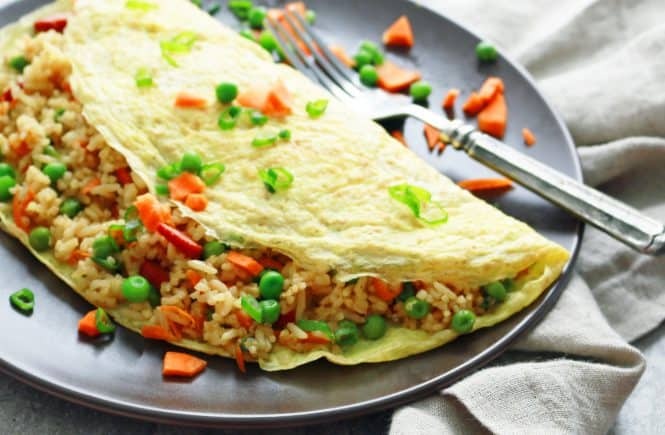 To pack for school lunch, I spoon fried rice in the middle of the omelette and wrap all edges over to make a neat square or rectangle (depending on the shape of the lunch box) and place seam side down in the box. If you’d like more interesting lunch box ideas, then check out Turkey sandwich on a stick or Potato pesto grilled cheese sandwiches or Hot dog grilled cheese sandwiches. Classic fried rice, except made even better with hot dogs and then wrapped in an egg omelette to make a fun, interesting presentation!!!! Stir together soy sauce, fish sauce and sesame oil in a small bowl and set aside. Add 1 tablespoon vegetable oil to a large skillet and place over high heat. When hot, add garlic and stir fry for few seconds (don't let get golden) and then add green peas, carrot and hot dogs. Cook (stirring occasionally) for about 2 minutes until vegetables are cooked. Stir in green onions, rice, pepper powder and sauce. Stir fry for about 1-2 minute until sauce is absorbed into the rice and rice is heated through. Place a medium non-stick skillet with 1 teaspoon vegetable oil (spreading the oil to coat the bottom of the skillet) over high heat. Add half the beaten egg, swirl pan around for the egg to coat the bottom of the skillet. Cook until the bottom is golden brown and carefully remove onto a serving plate with a rubber spatula. 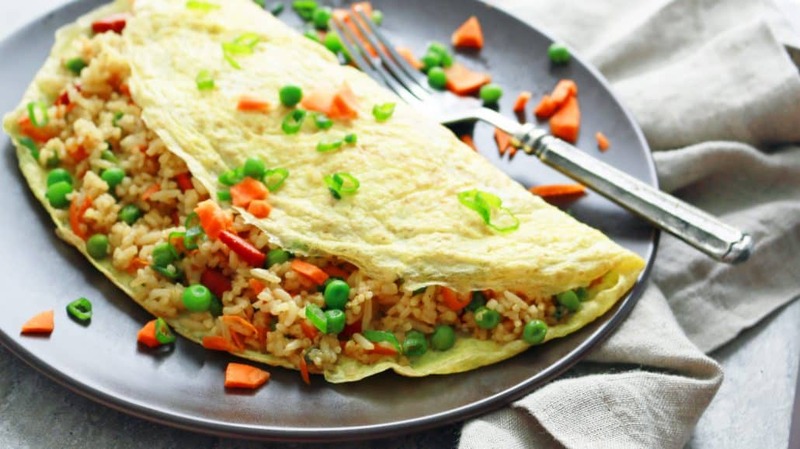 Place about half the fried rice over half the omelette, fold the other half over and serve immediately. Repeat process to make the remaining omelette. Use leftover cooked chicken - Add 1/2 chopped leftover cooked chicken along with carrot and peas and proceed with recipe as directed. Use raw chicken - Add 1/2 cup finely chopped chicken along with garlic in step-2. Stir, until chicken begins in no longer pink on the outside. Add the veggies and proceed with recipe as directed. 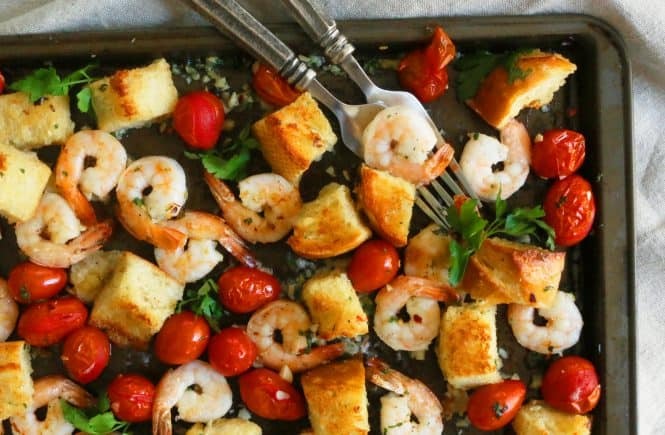 To use shrimp instead of hot dog: Add few cleaned and deveined shrimp along with garlic in step-2. Stir, until shrimp begins to turn pink. Add the veggies and proceed with recipe as directed. To make fried rice with scrambled eggs instead of omelette: Heat 2 teaspoons of vegeatble oil in the large non-stick skillet. Add 3-4 beaten eggs, cook over low flame (stirring to scramble) until cooked through. Transfer eggs onto a plate. Place pan back over high heat, and proceed with the recipe. Finish by stirring in the scrambled eggs into the rice. Serve. To pack for school lunch: I spoon fried rice in the middle of the omelette and wrap all edges over to make to neat square or rectangle (depending on the shape of the lunch box) and place seam side down in the box. Maria, your recipes always make me smile!! This is so genius. You should have a cookbook dedicated to meals for kids!! The best! Wow! So many of my favorite ingredients in just one dish, Maria! Is there any alternative to the soy sauce? 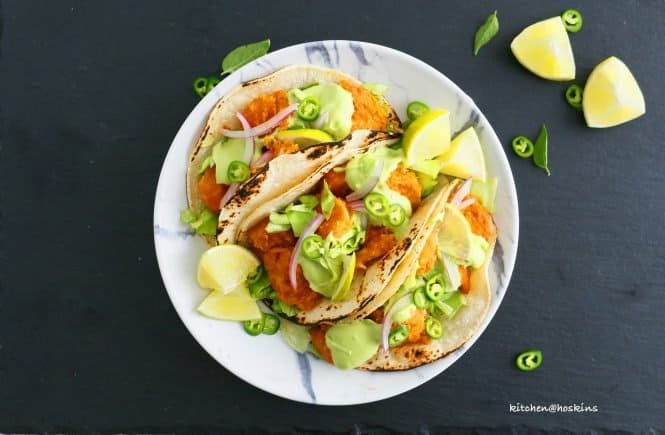 This is such a fun meal for kids and fussy eaters! And with that egg omelette on the outside, its very filling too!